Posted at 1:41 pm on November 14, 2012 by Lori Z. As Twitchy reported, President Obama is finally gracing the press with his presence today. It’s been far too long; Unrequited love hurts! Obama presser will be like Paula Broadwell panting after Gen Patreus at a staff meeting. President Obama was way too “exhausted” from campaigning to hold the traditional post-election presser. Priorities! Pres. Obama sure to face questions about the handling of the attack in Benghazi that killed 4 Americans including his Amb Chris Stevens. Are you sure about that Mr. Knoller? Or will the presser be filled with typical softball questions? #ObamaPresserQuestions Are racist Republicans obstructing your clear mandate already? Twitter users prepare with some predicted questions. There may not be time for all those, though. Ready for Obama presser. Word is he will take only 8 questions. I think the first question at the Obama presser will go to Pimp with the Limp. Heh. Can we spot him in the crowd? Popcorn time! Nothing beats following an Obama presser by reading tweets. Of course they're rare enough that the novelty hasn't worn off. And, drink! Here comes the “middle class being held hostage” by those mean, old Rethuglicans. Post-partisan! Come on, everyone had to tweet that. It’s classic drinking game fodder. 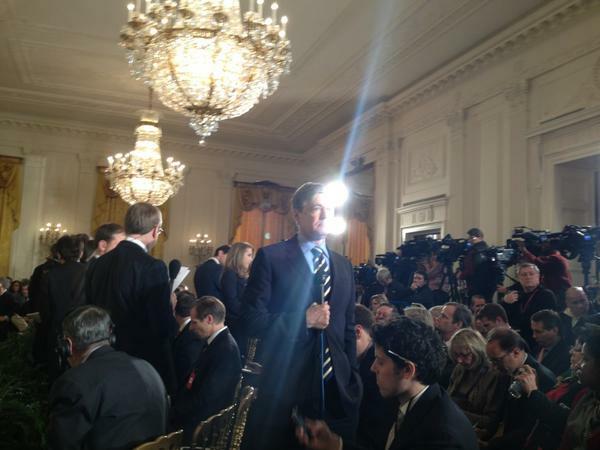 Reporter to Obama: How do we know you are not going to cave on Bush tax cuts again? Great question for Obama at presser: "Why should the American people believe you won't cave again (on Bush tax cuts)?" Rut-roh. Who asked that? They may not be invited back. No pesky Petraeus questions, y’all. Buck passing, as always. Finally, he admits that he knows nothing. No, really. He said it. Obama: "Ask the FBI about the investigation. I know nothing … nothing … nothing …"
Twitter users agree that he’s clueless. Since #obama knew nothing about anything having to do with our natl security, who is leading our country as commander-in-chief? He evidently still knows how to pander, though. Pander like the wind. Next question from Telemundo. Immigration question. Obama giving maybe the most pandering response of all time on question about whether he'll send immigration reform bill to Congress. On immigration reform Obama says he's very confident Washington can get it done after big Latino turnout at pools: "we need to seize moment"
MT @BuzzFeedAndrew: Obama says undocumented workers should be able to earn citizenship, earlier in presser just said "legal status." For his aggravating pronunciations, he must pay. MT @lachlan: Obama: "Two years ago, the economy was in a different situation." Q3 2010 GDP growth: 2%. Q3 2012: 2%. Oh, dear. So is compromise. Greatest Orator Ever: Compromise is hard. #Obama Presser: Is this really happening?? What a bunch of weak-kneed, cowardly alleged journalists. Nothing but softball BS. Wow. Oh, my! A Benghazi question actually enters the pathetic mix. Obama defends her. Unbelievable. Well, totally believable, but still. Obama scolds Sens. McCain, Graham, saying if they "want to go after somebody, they should go after me," not Rice. Big, strong man will protect the poor dear! Is he finally admitting the buck stops with him? Doubtful. He’s just trying to get people to shut up about the buck. If Pres Obama would rather focus be on him than Ambassador Rice, good. He should visit the Senate and testify if he is a man of his word. Sen. Graham lets Obama know that he does hold him totally accountable. RT @GrahamBlog Mr. President, don’t think for one minute I don’t hold you ultimately responsible for #Benghazi. Heh. Campbell Brown notices Obama’s pitiful “big, strong man” Rice-defending behavior, too. Wow! Ed Henry with an awesome question. Ed Henry gets 7th q — asks Obama whether he issued any orders on Sept 11 to protect lives of Americans that were killed in Benghazi. Obama is not pleased. How dare he ask a pertinent and probing question about something important? Obama not happy with that Ed Henry Benghazi question. . .
Obama claims Middle Class mandate in response to Benghazi question. Obama pivots off Benghazi to "middle class families." Clearly very uncomfortable answering Benghazi questions. No doubt. Now he admits that America deserves far better than HIM. Obama: People "deserve a better government than they've been getting." 4 Americans dead in Benghazi and we get a question about climate change. "The temperature around the globe is increasing, faster than it was predicted even 10 years ago," says Obama. One reporter just treated Obama as if she was a Beatles fan girl and he was Paul McCartney at Shea Stadium in 1965. WTF, media…wtf? If you're still wondering why Obama won reelection, the media questions so far should help you figure that out. First press conference in 8 months and I learned absolutely nothing new. Especially on Benghazi. Lappy McLapdog. RT @toddstarnes: Reporter: "Thank you, Mr. President — and congratulations." "I've never seen you lose." These Obama lapdogs put the sick in sycophant. know why that was called the #ObamaPresser? because the media were invited to press their lips…. Can they even function without having drool buckets at the ready? Must now write "I will not shout out questions at the president" 100 times on the chalkboard. Aww, poor baby won’t answer a “shouted” question. Poor precedent and stuff. Pres Obama declines to answer shouted question on kicking fiscal cliff down the road. Says it be a "horrible precedent" and walks off. Shorter Obama press conference: I don't know what my gov't is doing; I just know you need to pay more for it. You voted for incompetence, America. You got it!